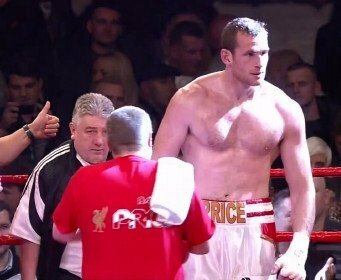 By Michael Collins: David Price (15-0, 13 KO’s) successfully defended his British and Commonwealth heavyweight titles tonight with a nice 2nd round TKO victory over Mat Skelton (28-7, 23 KO’s) at the Aintree Equestrian Centre, Liverpool, Merseyside, United Kingdom. Price took his time with the 45-year-old Skelton, but then turned up the heat on the aging fighter in 2nd round after hitting him with a nice body shot that sent Skelton retreating to the ropes. Price then unleashed an 8-punch flurry that ended with two solid lefts to the body that put Skelton down on his hands and knees on the canvas. Skelton’s corner threw in the towel before the knockdown but the referee failed to see it. Skelton landed several decent right hands in the opening round after rushing Price in the opening seconds of the round. However, Skelton didn’t have the power or the handspeed to worry the 6’8″ Price, and by the end of the round Skelton was already starting to look tired. Price will likely be moved up a little in his next fight. There’s talk of another 40-year-old fighter for Price to fight with 41-year-old Tony Thompson a possibility. Price doesn’t seem to fight with any real fluidity. He looks really stiff in the joints despite having pretty decent power. I just don’t see him being able to beat a good heavyweight that can throw combinations and who has some athletic talent. I rate American heavyweight Deontay Wilder as a much better prospect than Price with a much higher ceiling. A fight between Wilder and Price would likely be something similar to Lennox Lewis vs. Andrew Golota. Price is just too mechanical and a fast heavyweight with skills and power like Wilder would be a huge problem for the 6’8″ Price. That’s not to say that Price can’t find a niche somewhere and possibly pick up one of the world titles someday. I think he can. Once the Klitschkos retire, Price can scoop one up and he’ll be okay as long as he doesn’t run into someone Wilder or one of the other heavyweight contenders that can throw combinations and who has power.